I’ve always walked by Liebreiz (which can be translated as “charm”) thinking that I definitely needed to go there sometime. But – as things always are – I had never been…until last week! I find this place quite appealing, since it’s a mix of café and store. One half of it can be used to enjoy drinks and cakes, to chat and relax. 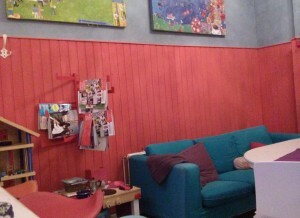 Colourful furniture and wall decoration provide a welcoming and playful atmosphere. Apropos playful, there’s one corner with toys for children. In case you have small kids, they can be kept busy, which might give you some time to eat or drink your refreshments with relish. On your own and are afraid to get bored? Don’t worry: there are magazines and newspapers you can read, or you can simply watch the hustle and bustle outside on Doberaner Platz. 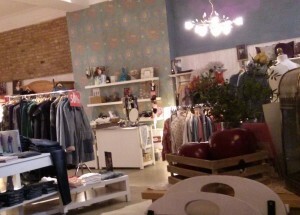 The other half is a small woman’s paradise, for one can shop for clothing and accessories. If you’re looking for cute, romantic, and fancy stuff, you won’t be disappointed. Labels not everybody knows are on display there: NOA NOA, st-martins, or set for example. Unfortunately, seen from my perspective as a poor student, most of the things cost a small fortune. 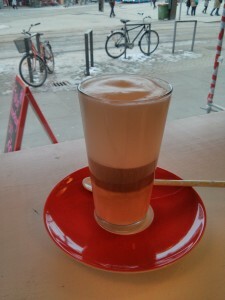 I had a Latte Macchiato, which was also a tiny bit expensive (2,70 €) regarding the great amount of foam on top of the coffee layer. However, I appreciated that it came in a pre-warmed glass. I can’t stand drinking lukewarm beverages that are supposed to be hot. The waitress was very friendly and polite: She even addressed me with “Sie” (the courteous form of addressing a person in Germany). In sum, it is a place I’ll go again…though next time with more money in my pocket. Originally I’m from Fehmarn, an island in the Baltic Sea not too far away from Rostock. I’ve been living in this city for more than two years now and will hopefully be able to enrich your trip by sharing my experiences with you. Have fun with our blog and enjoy Rostock! This entry was posted in Cafes, News, Where 2 Eat/Drink/Go Out and tagged cafe, kids, rostock, shopping. Bookmark the permalink.